UPDATE: Trailer for Izanami can now be seen at the bottom of the page. The arcade version of BlazBlue: Central Fiction is set to be updated on January 28. The update will make Hades Izanami a playable character. Izanami has made an appearance as a non-playable character in previous entries in the series. She was also a non-playable boss in Chronophantasma. 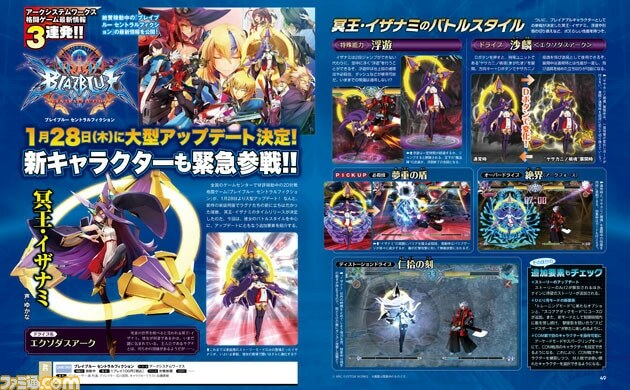 This is the first time Izanami will be made playable in the game. Her being playable was revealed in the latest issue of Weekly Famitsu. You can check out an image from the announcement below. The game is currently only available for Arcade systems. No release date has been announced for any home console systems. Here is a trailer for Izanami’s upcoming debut.